I am practically obsessed with finding nonfiction picture books. The vast majority of the nonfiction books for children that I’m finding at the library tend to be essentially mini-textbooks. Dry and boring. However, I’m delighted to see there seems to also be a fair amount of nonfiction in an appealing picture book format! [amazon_link asins=’B003V4B4R0′ template=’CopyOf-ProductAd’ store=’homeschoolrealm-20′ marketplace=’US’ link_id=’90161870-3172-11e8-9d7c-8f40ac384c1c’]This is one of those books. 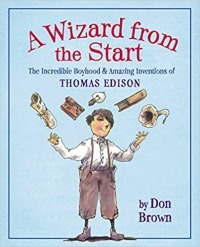 The story of Thomas Alva Edison, his life and accomplishments is narrowed down into an easy read format for children, with appealing pictures to accentuate the story. Great for a read-aloud to youngers and short and interesting enough for older children that are readers to read to themselves.